ANT Technologies — Paperless, cloud-based, operational technology for HVAC & Control Contractors. A Project Status Report you can trust! As an integrator or contractor, you’ve probably received unreliable progression reports on your company’s projects. Project Tracker™ eliminates the guess work and provides managers with real-time accurate data that ensures you make the best decisions possible. Instant and improved Service Reports! Working with Service Tracker™ improves service report details. Reports can be immediately entered into the system on-site and are always searchable. The reports are sent electronically to your client which increases their knowledge of the work accomplished. Works with all types of meters: Water, BTU, gas, or electrical! 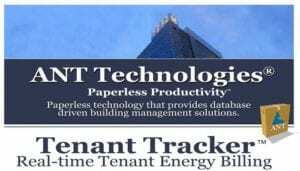 Tenant Tracker™ utilizes an analytics software to ensure accurate readings. The software identifies unusual spikes or drops in meter readings, thus ensuring appropriate billing and tenant confidence by taking the necessary steps to correct the data. Automate reliable meter billing!